>>Welcome to Art & Beyond Studio, Inc.
We were established in 2003 and provide full graphic design services operating remotely to make everything more convenient and beneficial for our clientele. Art & Beyond Studio, Inc. is a company that offers a variety of graphic art services to fulfil the needs of all clients who walk through our doors. Art & Beyond Studio, Inc. is located in Morton Grove, IL, USA — a Northwest suburb of Chicago. We offer creative design solutions for both traditional print media and new technologies to meet our clients’ wide range of personal and professional needs. ﻿In addition, we provide printing services for all the finished products. Working with hand selected printers we guarantee quality and affordable prices. 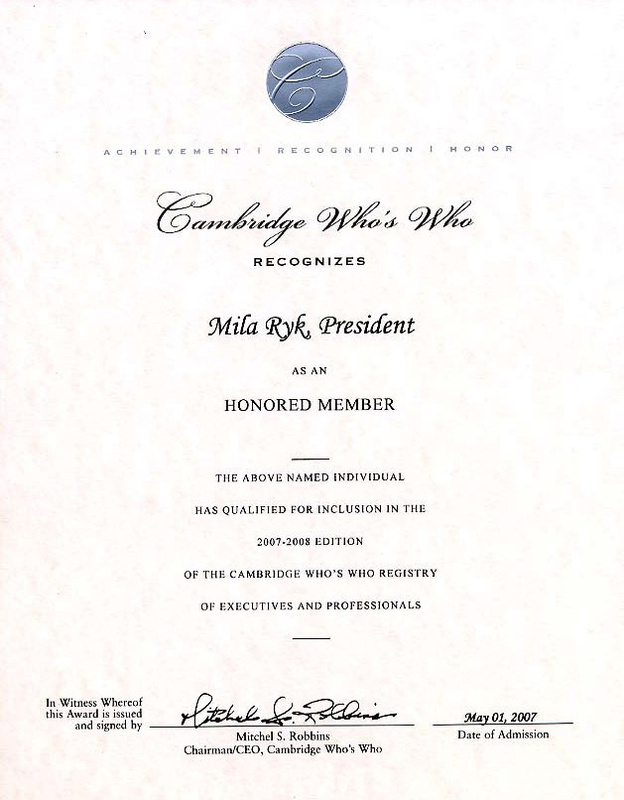 CAMBRIDGE WHO'S WHO recognizes Mila Ryk, owner of Art & Beyond Studio, Inc. as an HONORED MEMBER and has qualified for 2009-2010 edition of the CAMBRIDGE WHO'S WHO REGISTRY of EXECUTIVES and PROFESSIONALS.